Fredericks & Freiser is pleased to present an exhibition of new work by Blane De St. Croix. The exhibition will include a massive sculpture that fills the entire gallery space. Additionally on view will be several drawings/collages. De St. Croix investigates the human relationship to the contemporary landscape and its conflicts with ecology and geopolitics. This will be his first one-person gallery exhibition in New York. Dead Ice is based on De St. Croix’s extensive field research in the Svalbard Archipelago in the Arctic Circle. After travels on an ice breaker ship, ground site visits, photographic documentation, aerial flyovers, zodiac excursions to glaciers, explorations of abandoned mining towns, as well as numerous interviews, De St. Croix’s sculptural and drawing practice focuses on the iconic landscape with metaphorical roots in the region’s complex history. The scientific term “dead ice” refers to a glacier which functions like a living organism. When a glacier ceases to move, it melts in situ, shedding ice. This dead ice is no longer a part of a living glacier. De St. Croix’s project serves as both a monument to the Arctic’s awe-inspiring beauty and as a memorial to its rapidly melting ice. Symbolically, it refers to the brutal nature of the environment upon humans and vice versa. 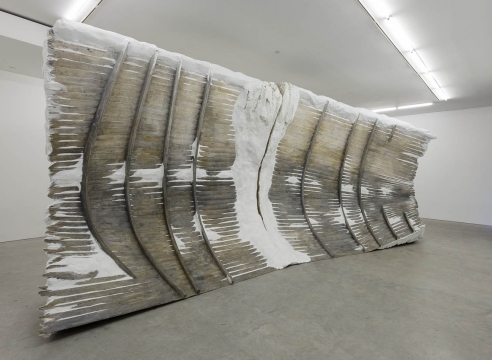 The monumental sculpture Dead Ice depicts two distinct sides dividing the gallery space in half and behaving as a border: one side human, one side the natural world. This piece was made through an elaborate process of painting, layering, and sanding a variety of ecologically friendly and recycled materials. eerily preserved ghost town. Permafrost is earth that has been frozen for more than two consecutive years; this polar phenomenon assists in the radical preservation of structures in the Arctic as well as aiding in the difficulty of mining. The works on paper in the back gallery were produced from on-site aerial and ground photographs shot in the Arctic’s Svalbard Archipelago. This documentation was the source material used to create unique drawings that were then turned into digital archival prints, shredded, and applied in multiple sculptural layers to the canvas. The original source drawings were also included in the final work, with direct ink drawings applied to the collage. Underscoring environmental protection issues, territorial rights, and failed exploratory attempts, De St. Croix gives form to our never-ending desire to control the natural world. 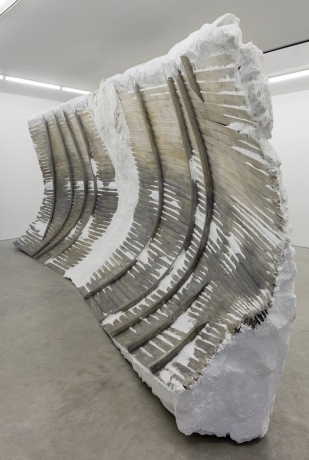 Blane De St. Croix has been awarded the John Simon Guggenheim Memorial Foundation Fellowship, the Joan Mitchell Foundation Grant for Painters and Sculptors, the Pollock Krasner Foundation Grant, the MassArt Alumni Award for Outstanding Creative Accomplishment, and the National Endowment for the Arts Fellowship in Sculpture. He has exhibited widely including the Sculpture Center, NY; Weatherspoon Art Museum, Greensboro, NC; The Land Art Biennial, The Mongolian National Art Gallery, Ulaanbaatar, Mongolia; The Contemporary Art Center, New Orleans, LA; The Kathmandu International Triennial, Nepal Art Council, Kathmandu, Nepal; The Johnson Museum, Cornell University, Ithaca, NY; Laumeier Sculpture Park, St. Louis, MO; Gasworks Gallery, London, England; Tomio Koyama Gallery, Tokyo, Japan; Art In Embassies Program of the U.S. Department of State, Washington, D.C; and Socrates Sculpture Park, Long Island City, NY among many others. The artist was born in Boston. He lives and works in Brooklyn, NY.